LAETARE JERULALEM! (REJOICE, O JERUSALEM!) - This Sunday marks the halfway point in our Lenten journey - Laetare Sunday or Joyfilled Sunday. Today, we take a break from the sorrows of our sins and focus on the result of our repentance - the joy of reconciliation. 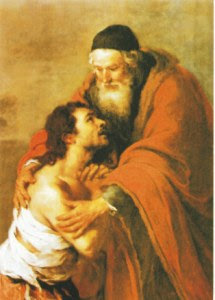 What we find is a merciful and forgiving Father who yearns to reconcile us to himself. This Sunday's readings show us two faces of our merciful Father - one who reconciles the entire people of Israel to himself and the other, one who runs out to greet his "lost son" and rejoices at his return. It is this rejoicing that we focus on today. In our first reading (Joshua 5:9-12), we hear of God removing the "reproach of Egypt" from Israel, who that year ate in the promised land. "The LORD said to Joshua, 'Today I have removed the reproach of Egypt from you.' While the Israelites were encamped at Gilgal on the plains of Jericho, they celebrated the Passover on the evening of the fourteenth of the month. On the day after the Passover, they ate of the produce of the land in the form of unleavened cakes and parched grain. On that same day after the Passover, on which they ate of the produce of the land, the manna ceased. No longer was there manna for the Israelites, who that year ate of the yield of the land of Canaan." Our Gospel reading (Luke 15:1-3; 11-32) is the parable of the Prodigal Son. We hear of the Father's merciful joy and forgiveness as his son, "who was lost", repents and returns to his father. In today's passage, the pharisees complained that Jesus "welcomes sinners and eats with them. ", so Jesus told them the parable of the Podigal Son, of which we are all familiar. On the son's return after squandering his inheritance, his father rejoiced and ordered a feast. The father's other son became upset and refused to join in the feast..
"He became angry, and when he refused to enter the house, his father came out and pleaded with him. He said to his father in reply, 'Look, all these years I served you and not once did I disobey your orders; yet you never gave me even a young goat to feast on with my friends. But when your son returns who swallowed up your property with prostitutes, for him you slaughter the fattened calf.' He said to him, 'My son, you are here with me always; everything I have is yours. But now we must celebrate and rejoice, because your brother was dead and has come to life again; he was lost and has been found.'" In our Epistle reading (2 Corinthians 5:17-21), Saint Paul instructs his readers that God has reconciled us to himself through Christ and as such, we are expected to respond accordingly. "Whoever is in Christ is a new creation: the old things have passed away; behold, new things have come. And all this is from God, who has reconciled us to himself through Christ and given us the ministry of reconciliation, namely, God was reconciling the world to himself in Christ, not counting their trespasses against them and entrusting to us the message of reconciliation. So we are ambassadors for Christ, as if God were appealing through us. We implore you on behalf of Christ, be reconciled to God. For our sake he made him to be sin who did not know sin, so that we might become the righteousness of God in him." And so, we have much to rejoice about as we complete our Lenten journey, knowing that through Christ's suffering, death and resurrection, we are all reconciled to God; and our Eucharistic Celebration is the feast the Father prepares for us. May we respond accordingly.